After many years I am finally in $$ position to own my "dream" car AND do what I want with it. Not Porsche, not Ferrari. My MINI. I'm learning about my options for my "07 S Convertible. It's nice to have help/support from OUTMOTORING. I've survived my Harleys and my sailboats; now it's time for my love-lust since HighSchool, Thanks for your help and support. See? Wait long enough and it's yours. New Lower Stress Bar, new Colored Gauge Gaces, and new Hood Scoop. Oh MY! + Shop at OutMotoring today! + We're adding nearly 2,000 products each MONTH! + What's new at OutMotoring? You've likely noticed the major design upgrade to our site and we hope you enjoy the new features, navigation and graphics. We're thrilled with the new website and find it easier to navigate and shop and you do too. 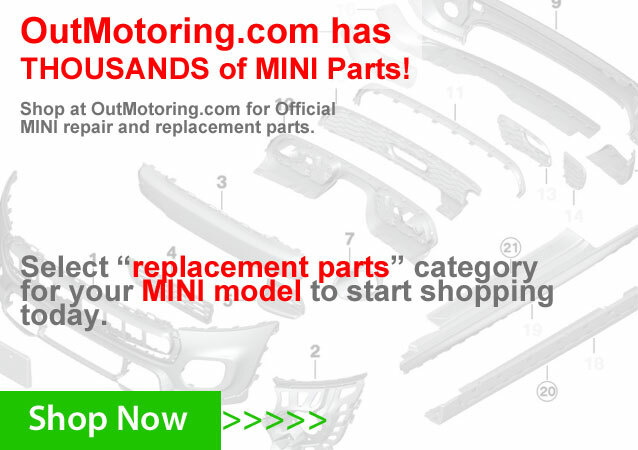 We're constantly adding OEM repair and replacement parts. If you need a part we've not added yet just email us the part number and we will get it for you! Copyright © 2016 OutMotoring, All rights reserved.